We handpicked 5 (of what we deem to be our most popular) tags, to dive a little deeper and highlight the 5 W's (What, Where, When, Why, Who) of tags. 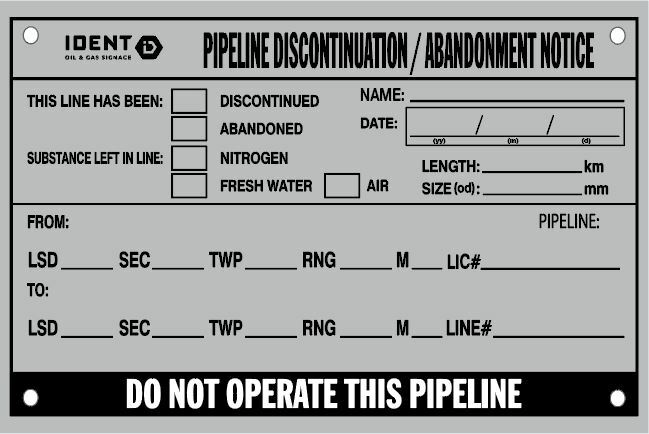 Discontinued Pipeline tags are typically ordered by Field Operators and found outdoors, attached to the riser portion of the pipeline. The tag is there to indicate which pipeline(s) is being temporarily or permanently shut down (duh), with information where the pipeline starts and stops, products the pipeline was cleaned with, and what was in the pipeline before being cleaned. 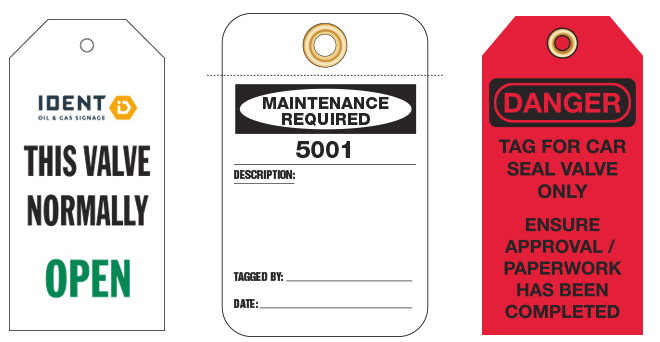 Inspection Tags are usually ordered by Maintenance Foremen or HSE Personnel, and are usually found indoors, attached to a first aid kit, fire extinguisher, eyewash station or any other station/product that must be kept up to date. These tags are usually used for multiple years before biting the dust, but can be customized to fit any need. 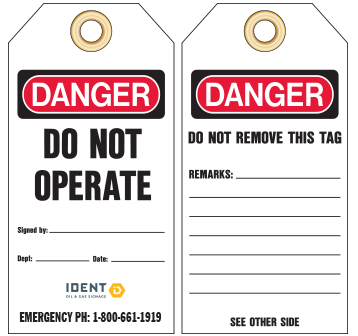 Flange Inspection Tags (also know as Torque Tags) are similar to inspection tags, but a little bit more elaborate. Typically ordered by Maintenance Foremen or HSE Personnel as well, and can be found in both indoor and outdoor applications. These tags are there to clearly identify the various stages of inspection, modification and maintenance throughout the flange inspection process. Maintenance Foremen are typically in charge of ordering Valve or Repair Tags. Valve Tags can be found typically outdoor, or in environments where the tag is exposed to the elements such as chemicals and is typically paired with a lock. They are mainly used for maintenance purposes or going through a turn around to indicate that the valve/line is shut down. Since Valve Tags are mainly used for maintenance purposes you can usually find them paired with a repair or maintenance tag as well. Maintenance Foremen usually order Do Not Operate tags for indoor or outdoor uses to ensure that dangerous machines are properly shut off and not able to be started up again until maintenance or repair work is finished. These tags can be put on every valve in the area being shut in to really enforce “Do Not Operate.” Lockout Tags can be paired with a repair tag or discontinued pipeline tag. If paired with a Discontinued Pipeline tag, the lockout tag would typically be attached to the valve, while the Discontinued Pipeline tag would be attached to the pipeline. Whmis Tags are usually ordered by Field Operators or HSE Personnel, and can usually be found in outdoor and indoor applications, attached to a product, tank or container. 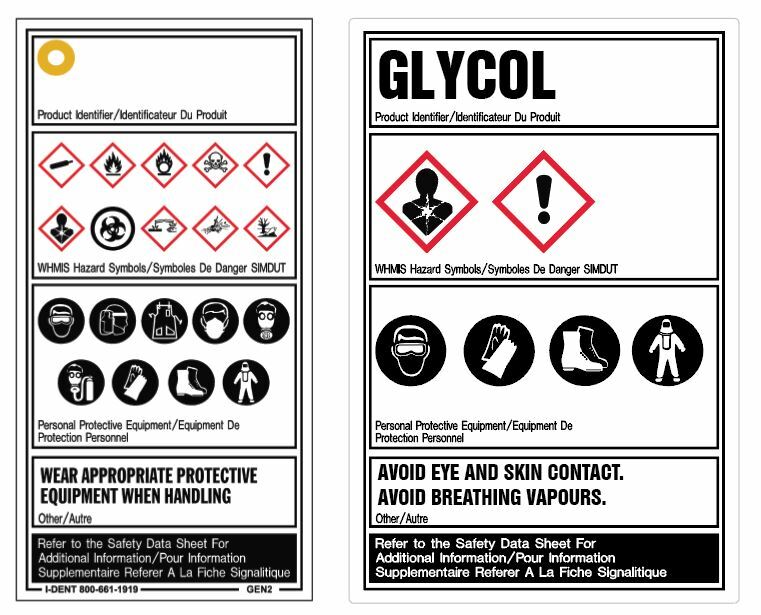 Whmis Tags are another way to identify product if a decal isn’t the best solution. These tags are used to identify product with associated hazards and PPE requirements, depending on how it is stored it may be flammable, etc. Gloves, eye protection and boots are typically used on the tags as they’re a daily requirement. There are many requirements OSHA has for safety signs and tags, and it is important that every one of them are followed. This can be tricky if you order your tags and other signage from a third party every time they are needed, but no need to fret- IDENT knows all the requirements so you don't have to! Make sure that your facility is labelled properly- give us a call, we'd love to help!